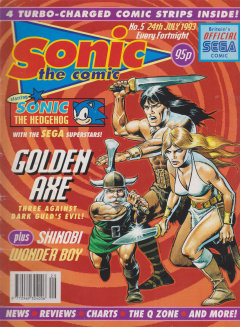 Sonic the Comic 5 is the fith issue of the Sonic the Comic series by Fleetway. 1 Sonic the Hedgehog - "Lost in the Labyrinth Zone"
Sonic the Hedgehog - "Lost in the Labyrinth Zone"
7 a.m. in the Green Hill Zone, and Sonic the Hedgehog finishes his morning workout. He managed to run 750 mph (just 18 mph shy of the speed of sound), but he insists that he must be faster. Then, to Tails' disgust, Sonic sits down to a breakfast of over 200 hamburgers. Suddenly, Tails is captured and pulled underground by a tentacled robot: Arachbot. Arachbot explains to Tails that they have entered the Labyrinth Zone, a vast network of tunnels that the badniks have recently dug under half of planet Mobius. He also explains that Doctor Robotnik is determined to turn Tails into a badnik, and has even supplied Arachbot with Tails' old Robofox armour (from Sonic the Comic #2) for this purpose. Sonic and his animal friends (including Sally and Johnny Lightfoot) follow Tails into the tunnels, avoiding numerous traps like spiked balls, shooting spears and spike traps underfoot. They eventually catch up to Arachbot, who reveals that Sonic cannot change him back into an animal because he is a Prime Badnik: a pure robot, without an organic battery. Arachbot causes the Labyrinth to flood. His friends (including Tails) get out of the water, but Sonic goes back for the Robofox exo-skeleton, and empties the oil into the water. Then, as the Arachbot approaches he activates the suit's weapons system, a flamethrower, setting the oil alight and destroying the Arachbot in the fire. Back in the Green Hill Zone, Sonic finally sits down to breakfast: 300 hot dogs and 100 thick shakes. When Tails protests that Sonic has already had breakfast, Sonic reveals that was just the first course. Arachbot mentions Robotnik's desire to turn Tails into a badnik. Robotnik attempted to do this twice before, first with the Robofox exo-skeleton (which itself appears in this issue) in Sonic the Comic #2 and again with the Badnik Tails in Sonic the Comic #4. Joe Musashi moves to the next level of the Fear Pavilion, hoping to rescue Naoko and avenge his slain master. The next martial arts master is a large masked man on stilts. He is also very arrogant, and Musashi hopes that he will reveal some secret information about the Sinister Four, the cruel leaders of the Neo Zeed. Indeed, as Musashi pretends to be defeated, the man reveals that he is the final master that Musashi will face: Musashi is one floor away from Naoko. Musashi fights back, cutting one of the stilts and knocking the master down. He demands to know where Naoko is, and the man points him to the last level of the pavilion before even thinking. Musashi prepares to be reunited with Naoko. The resurrected emperor Dark Guld and the sorceror Blackspell have merged into a single body (with two heads) and call for the deaths of heroes Ax-Battler, Gilius-Thunderhead and Tyris-Flare. Blackspell pleads with Dark Guld to have his body back, but Guld refuses: he cannot survive in his own body unless the ritual is completed and one of the heroes sacrificed. Tired with the sorceror's complaining, Guld strikes Blackspell's head and knocks him unconscious. Ax-Battler uses the last of his magic to get rid of Guld's minions, but Tyris' fire magic proves useless against Guld himself. Guld transforms into a huge bird and carries Ax-Battler away to Firedrake Fell. Gilius and Tyris follow them on two Bizarrians. Once at the Fell, Ax is subdued by four headless suits of plate armour. Guld plans to sacrifice him so that Guld can live. Shion the Wonder Boy defeats the octopus, then encounters a mermaid and a merman named Lauren and Hardy. They show him where the demons went, but warn him not to follow. Meanwhile, Shion realises that his hand has become a demon claw - unlike his previous transformations into monsters, his hand feels like it is dying. Shion discovers an underwater bubble, and inside it seems to be Jungle World. He battles some evil toadstools then discovers a portal to Demon World, which he enters.